Democrats aren’t planning a shakeup despite the thumping they took at the polls on Tuesday. 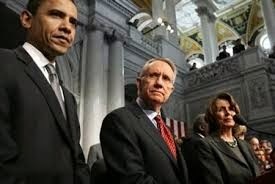 Leaders in both the House and the Senate — including Sen. Harry Reid (D-Nev.) and Rep. Nancy Pelosi (D-Calif.) — are expected to retain their spots atop the party in the next Congress, while the White House, in similar fashion, says it will keep its top staff largely intact. "The president is somebody who doesn’t make personnel changes just for cosmetic reasons," White House press secretary Josh Earnest said Thursday. The decision to stick with the status quo sends a clear message that Democrats believe Tuesday's disastrous outcome was caused by factors beyond their control, and that they see themselves as best suited to steer a comeback.But it's also sparked concern among some party operatives and rank-and-file members that the Democrats' rebound strategy lacks fresh voices, novel ideas and a new public image. Most of the grumbling is happening behind closed doors, but some are going public with calls for soul-searching in the party.